This next card is from another one of my favorite sets. 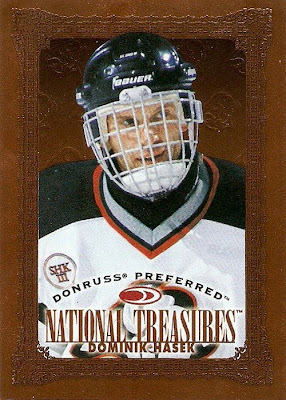 Its a 1997-98 Donruss Preferred National Treasures Dominik Hasek. There is just someting about these cards that I really liked when I came across about ten of them in a box of 800 commons. I have around 10 of them and they are all very sharp. 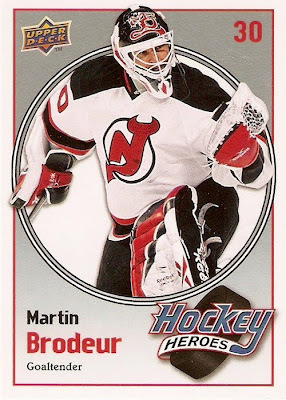 I like the bronze-colored metallic look to them and the intircate design around the border and the logos in the background are just awesome. 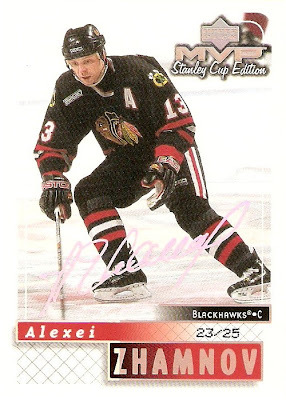 The other day when I was searching for more Super Script cards on eBay I came across a lot of Gold Scripts from the same set, 1999-00 UD MVP Stanley Cup Edition. I have plenty of the Silvers already, I would just have to go through and count the actual number. No Golds right now, but that may change if I happen to land that lot of ten on eBay, but who knows. I thought the Supers would be a lot, but this may just be too much. This particular card is part of one of my favorite sets, 1996-97 Metal Universe. 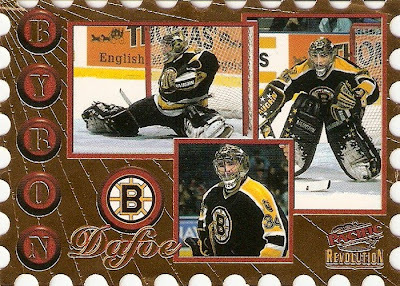 Every one in this set has a different background and the eyes on this Bill Ranford are just menacing. Hopefully someone will bring this set back to life but one can only hope. This card is one of the more interesting ones in my collection. Its a 1997-98 Pacific Revolution Return to Sender Byron Dafoe. I like the stamp cut out design, it has to be one of the more clever die-cut ideas out there. Just got the Tkachuk in the mail today. That brings the total to five. I'm hoping to make it six with the Sakic that I'm watching on eBay for $4.99 right now, but we'll see where that goes. This brings me to 2.27%, its progress but I've got a long way to go. I'd like to start sharing some personal favorites from my vast collection. These could be anything from an extremely coveted pull to a card I just think is downright cool. I am not planning on doing this on a weekly or daily basis or anything, just whenever I get some time or come across something I want to share. Well, I decided to hop on eBay again to look for some more super scripts. 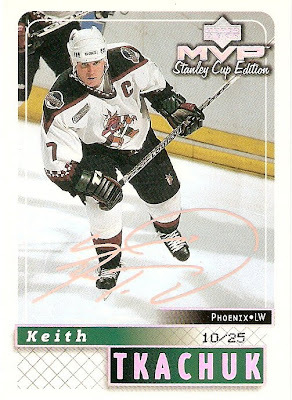 I found only two: Daniel Sedin, which is only numbered with no foil signature, and Keith Tkachuk. I lost the Sedin because the final winning bid was $67, a little out of my price range for right now. Won the Tkachuk with one bid for $12, not bad. 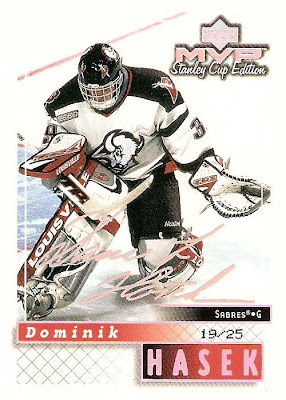 The Hasek and Kovalev were lucky pulls on my part. The other two I picked up as a pair on eBay for about $5. Like I said earlier, these are nearly impossible to track down. There are 220 total in the set, so I definitely have a long way to go, only 98.2% to go. 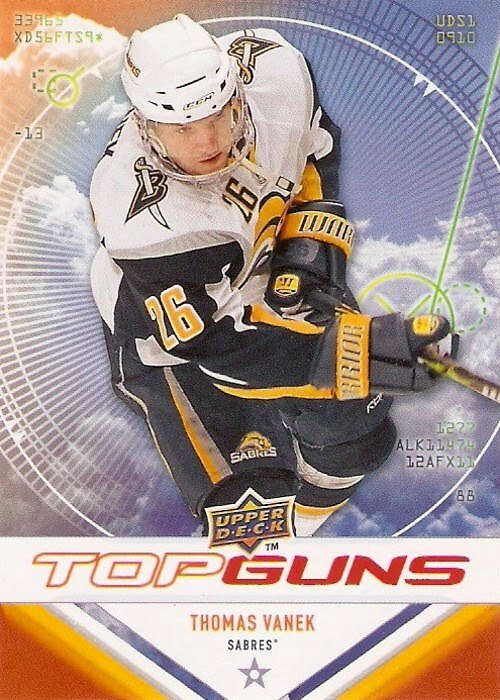 Welcome to Card Boarded, a blog about hockey cards. 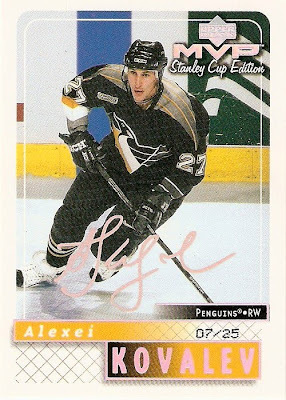 I'm 21 years old and have been collecting hockey cards for about 12 years now. As of right now, I would guess I have somewhere in the vicinity of 10,000 cards, both old and new, most of which are from 1990 on. My collection is not geared toward one team or another and I don't really collect any single player, build sets, or anything like that. I just love adding any new cards to my collection. 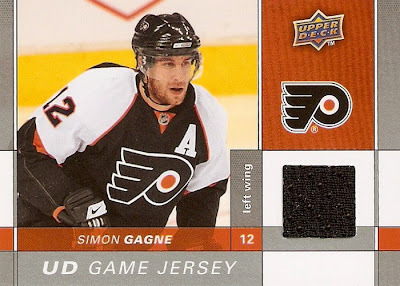 There is noting better than the thrill of busting open a brand new box of cards and ripping through pack after pack. You never know what you'll get, and that's the fun of it. Although I don't normally build sets, there is one in particular that has caught my eye and I've always wanted to complete it. 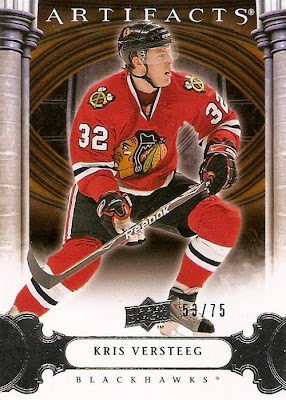 This set would be Upper Deck's 1999-00 MVP Stanley Cup Edition Super Script parallels, each numbered out of 25. I don't know why I like them so much, but my ultimate goal would be to get them all, which I am sure is pretty much impossible. I only have four of them right now, and I know there are plenty more out there, they're just extremely hard to track down. I'll dub this the Super Script Quest. With this blog I would like to share some of my personal favorites, experiences with collecting, the Super Script quest, and track any new additions to my collection.